Who knows? But this whole situation seems fairly familiar as we are also watching the UFC and Bellator fight over who owns the rights to Quinton ‘Rampage’ Jackson’s contract. 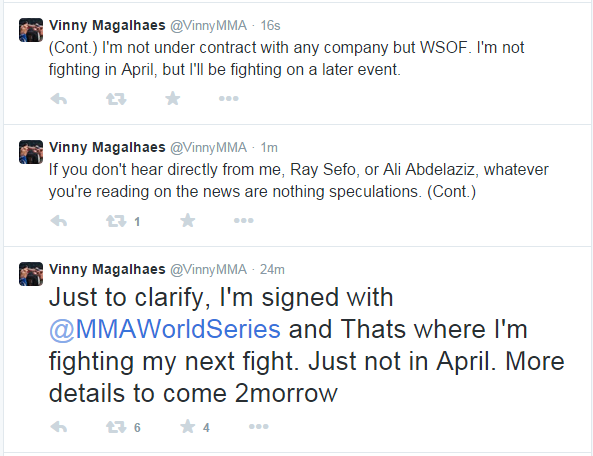 Now Magalhaes took to Twitter to state that despite what everyone is hearing, he is still under contract with WSOF and will compete for them at a later date. Magalhaes was a finalist in The Ultimate Fighter: Team Nogueira vs. Team Mir and has fought five times within two stints with the Ultimate Fighting Championship. He is the former Titan FC Light Heavyweight Champion, M-1 Global Light Heavyweight Champion and is also a multiple time jiu-jitsu gi and no-gi world champion. Magalhães currently fights in the light heavyweight division of the Absolute Championship Berkut. Also known as Pezão, Vinny is one of the top Brazilian Jiu Jitsu competitors of his generation.